It was Christmas Eve, 1995. 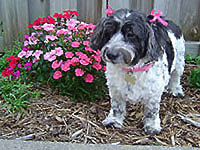 I had lost my dear dog, Martha, just a few months earlier. It was Martha who was going to be by my side as I transitioned out of the corporate workplace, looking for my soul work. I didn’t know exactly what that would be, but I knew it would have something to do with animals. I didn’t know Martha would become ill and leave me suddenly, before I knew what I was supposed to do with my life. I didn’t know it was her sudden loss that would put me on my true path. So there I was at midnight on Christmas Eve, standing at her gravesite in our backyard. I was in my bathrobe and slippers…and I was freezing! I don’t know exactly what I thought was going to happen. I had heard the story about animals being able to speak at midnight on Christmas Eve. Maybe I thought I’d hear her beautiful bark, or feel her magnificent shaggy coat one more time. After all, I’d already seen her in the arms of an angel. What was ONE MORE MIRACLE? Midnight came, and I could feel the magic in the air! I held my breath, and then all of a sudden….absolutely nothing happened! It would be 9 years later that I would experience my Christmas miracle. It came in the shower on New Year’s Day 2005. There I was, shampooing my hair, and suddenly I heard this story being told about an old dog who wanted to leave his sad earthly life and go to the heavenly world. He would do this through the Christmas Nativity – something I didn’t understand until I sat down to write the story. If I had sat at my computer for the rest of my life, fingers curled expectantly over the keyboard, I never could have thought of this story on my own. 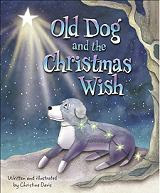 Old Dog and the Christmas Wish would be the last book I wrote and illustrated with my beloved dog, Jake, still curled up by my feet. Every time I read that book I feel Jake’s spirit running through the pages. One day I realized something – THIS was my Christmas miracle! It was the miracle I had been waiting for all those years earlier, come to me in the form of this magical book. And what better way for a miracle to manifest in a writer’s life than through a new book, clearly inspired by Martha, by Jake, and by a loving and wondrous universe.